I remember when I was little and my grandmother was cooking kielbasa in my kitchen. I ran outside as if the house were on fire, screaming that the smell was disgusting. (Further proof that I never ate much meat prior to my meatless days.) But aside from this moment of intense aroma, my grandmother has some culinary habits that have been passed down to me. My grandmother likes to compartmentalize her food. She doesn’t eat rice mixed with her protein and veggies, but rather she likes to enjoy the different tastes of the meal by having her protein, veggies, carbohydrates separated. I suppose this isn’t such a strange concept, but I have realized that I enjoy my food in the same way. Don’t hand me a bowl of rice covered in satay sauce and veggies. I’d rather enjoy everything on its own, savor the tastes in the amounts that I would like. Despite that she doesn’t eat very spicy foods or onions (whereas I will eat raw onions on command, particularly if there is ketchup around), she makes simple and delicious food. My mom’s greek salad is my grandmother’s recipe, with just a lemon and oil dressing over lettuce, tomatoes, feta, cucumbers and green onions. 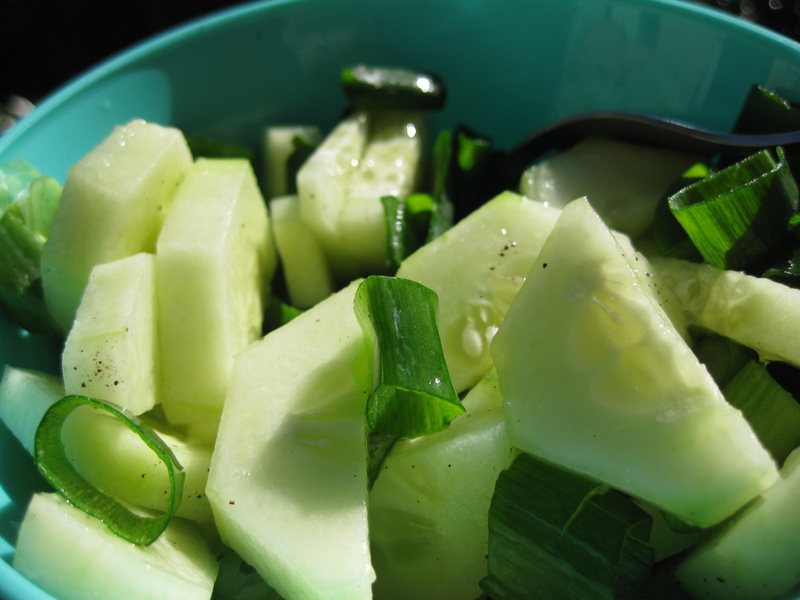 My grandmother told me that when she was growing up in Egypt, she would just slice a cucumber, drizzle some lemon juice and add a pinch of salt and pepper. And to this day, this is my favorite snack or side salad. There is something to be said about the simplicity of food.